It's a sad day when one cannot find a stash of nuts in my cupboards. It could even be considered an omen, though I happened to love black cats, ravens, and walking under ladders to spite fate. The truth is my cash is wiped out. I didn't realize how dire things were until it was discovered that I had no pecans for these brownies. They were supposed to be turtle brownies but I could not call them turtles without their precious nuts. It would be akin to calling a bowl of vanilla ice cream with whipped cream and a cherry a banana spit. It feels awkward, I almost feel incomplete without a healthy supply of walnuts, pecans and almonds. Somehow just knowing that they were available was a comfort I didn't realize I needed. True, I have been baking a lot the last few weeks. And I remember using the last of the nuts for my brown butter fig bars. More painfully I also remember being at the grocery store and having to chose between a large bag of pecans or some much needed coffee. Since the difference between me with caffeine and without caffeine is scarily similar to Dr. Jekyll and Mr. Hyde, I opted for the overly priced coffee ( sorry, some of the other brands give me a stomach ache). While I was removing my items from the cart I promised myself that I would be back shortly for some nuts. I was aware of the broken promise and it festered in the back of my mind. Despite this, It was still a shock to see the empty space where the pecans should have been living happily near my baking chocolate. The brownies were still sinfully rich and irresistibly gooey. Unless you are a nut lover, I don't think the pecans will be missed. The brownie batter is made from unsweetened chocolate so they have a pure, dark cacao flavour. Balancing that velvet, rich texture is a sweet robe of sea salt infused homemade caramel. 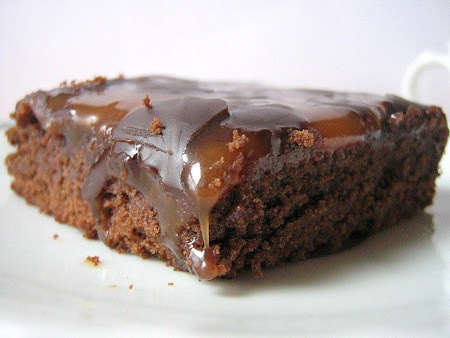 As if that were not enough to blow any holiday healthy eating plan, the caramel is drizzled with a chocolate ganache. The pecans at least would have offered some protein. 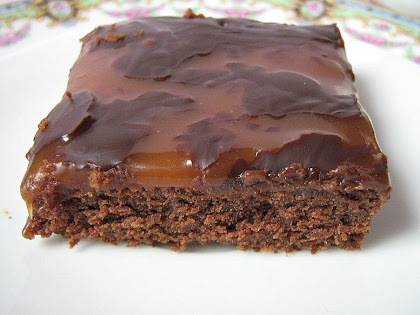 When I made these the first time, I had the nuts, but I lacked the confidence it takes to make caramel. I ended up with a weak, liquidy substance because I was afraid of burning it and I took it off the heat 5 years earlier than I should have. And yes, I know my photography skills were cringe inducing...that was indeed a flash. :o If only both worlds could merge, the pecans and the ability to make caramel. At least I have an excuse to make these brownies again. 12 Tbsp. (1 1/2 sticks) of butter. Cold and cut into small pieces for easier melting. 3 ounces of unsweetened chocolate, coarsely chopped. Preheat the oven to 350F. Butter or spray a 9x13 rectangle baking pan. In a separate large bowl, beat the sugars and eggs together until smooth. Add the vanilla and melted chocolate, Beat to incorporate. Scrape down the sides of the bowl and on low speed, beat in the flour and salt. Pour into the prepared pan and bake for 20 minutes or until the brownies are just barely firm to the touch (they should spring back when lightly touched in the middle). Remove from oven and cool on a wire rack. You won't need the oven again so you may shut it off. Make the caramel: Have the 1/2 cup of heavy whipping cream measured out and nearby. In a three quart Heavy saucepan, combine the sugar, corn syrup, water, and salt. Stirring constantly and over medium heat, bring the mixture to a boil. As soon as it begins to boil, Stop stirring. Cook the mixture until it turns a golden caramel colour. This may take 10-15 minutes. Every now and then swirl the pan around by it's handle so the caramel will cook evenly. Remove from heat and very, very carefully add the cream (it will sputter and steam). Keep stirring until the caramel calms down and becomes smooth. Immediately pour over the still warm brownies. Spread it around into an even layer and lightly sprinkle with coarse sea salt. Cover and refrigerate for an hour. Ganache: Place the chopped bittersweet chocolate into a heatproof bowl. In a small saucepan, bring the heavy cream to just below a boil. Immediately pour the cream over the chocolate and let it sit for 5 minutes. Stir with a whisk until smooth. Remove the brownies from the refrigerator and drizzle with the ganache. Cover and refrigerate again until the chocolate is set. Cut into squares using a hot, sharp knife. No worries about the nut issue - the brownies still sound FABULOUS! OMG, that looks SO DELICIOUS!!! I'll have to try that sometime. LOL about hoarding nuts, I do the same thing. I like the comfort of know I have stashes of them. 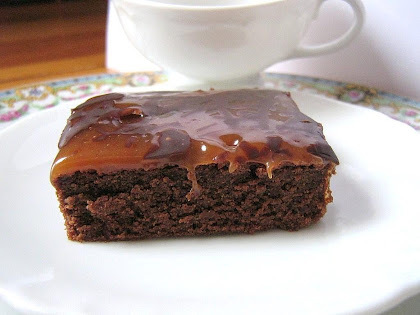 But, but this caramel brownie is gorgeous as is. I don't believe anyone would ever ask, "where's the nuts?" Oh my!! do I ever need to try these!! I just tried these. The caramel is really tough. It makes eating the brownie pretty difficult. Hi John, I'm sorry about the caramel. When I first started making my own caramel it was either too runny (undercooked) or hard (overcooked). The difference can be a matter of seconds. Once the bubbles along the edges begin to turn brown, keep a close eye on it. And be sure to gently swirl the pan around so there are no 'hot spots'. If you have the time, try cooking it over a lower heat setting so you will have more control over the process. I don't even wanna know how many calories are in these babies. Nope, don't care one iota. Not when they look so irresistible that I might just have to eat two at one sitting. Happy holidays! 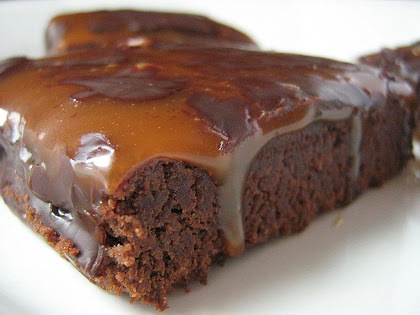 The caramel transforms these to something more than brownies.